Another record is posted for the Coyotes track & field team, as Senior Lara Boman broke her own throwing record at the Jim Emmerich Alumni Invitational Saturday in Brookings. Boman broke her own weight throw school record with a throw of 67 feet, 2 inches, beating her previous mark by eight inches. 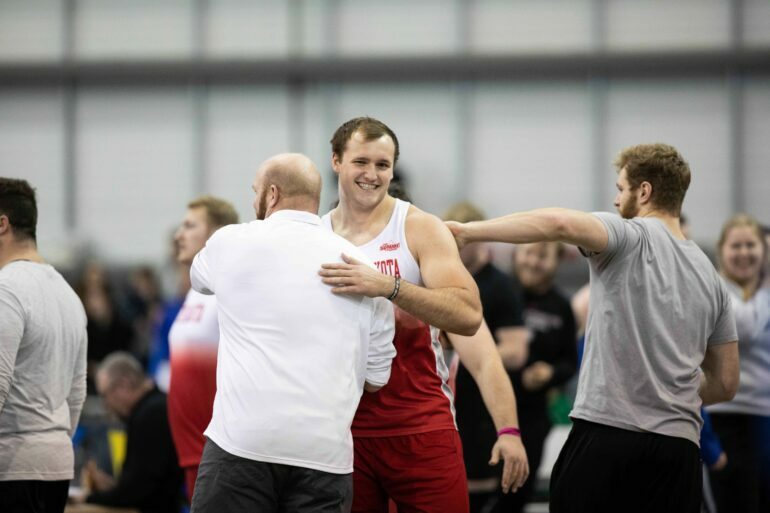 “Going into it, the goal was just to PR (personal record) and work on having a relaxed mindset during the meet, and just letting the throw happen,” Boman said. The throw helped her place third in the field, and she now sits 19th in the NCAA this season, according to GoYotes. The Coyotes dominated both men’s and women’s pole vault, sweeping the top four spots in each category. For the men, junior Chris Nilsen claimed the top spot in the NCAA, clearing 18-6 3/4. He now holds the national lead by three inches. Junior Nick Johnson took second with 16-6 ¾, while junior Ethan Bray and freshman Sean McClellan took third and fourth, respectively. Junior Helen Falda took the women’s division with a height of 13-9 ¼, moving her into 12th in the NCAA. Senior Kimmy Peterson captured second place with a vault of 12-11 ½, while sophomore Landon Kemp finished third and freshman Deidra Marrison took fourth. Redshirt-Senior Ethan Fenchel tossed a 66-5 ¾ in the weight throw to capture first place, landing a foot shy of the record he set last weekend. Senior Ben Hammer eclipsed the 60-foot mark in shot put for the first time in his career, winning the event with a throw of 60-3 ¼. His mark was also good enough to land him third-best in school history and 24th in the NCAA. USD swept the top three positions in women’s shot put, with sophomore Callie Henrich tossing 46-0 ¾ to take first place. Second place saw senior Mary Webster while freshman Josephine Starner placed third. The success of the throws group isn’t surprising to Boman. “This is the fourth year (head coach) A.G.’s been here. It’s kind of the culmination of implementing his coaching and having groups of people really buy into that,” Boman said. Senior Karina Dufoe captured first in the 200-meter with a time of 25.21 seconds, while junior Tasheka Gordon won the 60-meter, clocking 7.65 seconds. Junior Zack Anderson once again cleared seven feet in the high jump, hitting 7-1 to capture first. Senior Megan Billington took the 3000-meter with a time of 9:59.31. The team travels to Minneapolis this weekend to compete in the Jack Johnson Classic on Friday and Saturday.